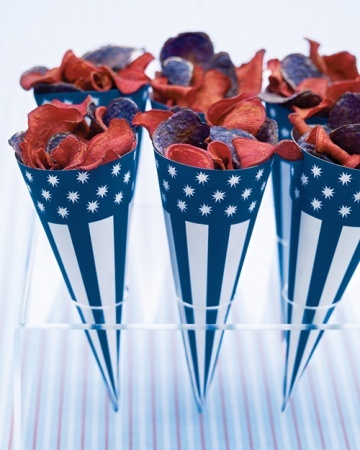 Like most sparklers, these are extinguished after a short while -- with several large bites. 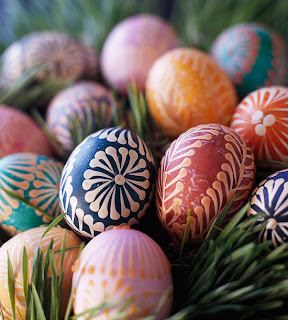 To make two dozen, place 4 ounces chopped semisweet chocolate in a heatproof bowl set over a pan of simmering water. Stir occasionally until melted; remove from heat. 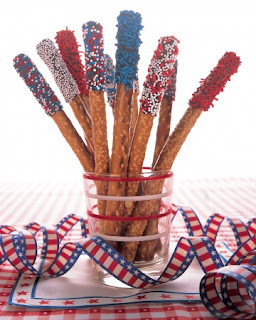 Using a pastry brush, coat the upper third of each pretzel rod in chocolate. Cover with sprinkles; stand pretzels upright in a glass. Place in the refrigerator until firm, about 5 minutes. Layered into mini canning jars and easy to make ahead, they're party-ready treats. In 1-quart saucepan, stir together sugar and water. Heat to boiling on high, stirring occasionally; stir in blueberries and lemon juice. Remove from heat. Let cool completely. In large bowl, with mixer on medium speed, whip cream until soft peaks form. Gently fold in cooled blueberry mixture. Place a single layer of angel food cake on bottom of 1 canning jar. Top with 2 tablespoons strawberries, then 2 tablespoons blueberry whipped cream. Repeat layering of cake, strawberries, and whipped cream. Repeat with remaining 7 jars. Serve immediately, or replace screw caps and refrigerate up to 1 day. 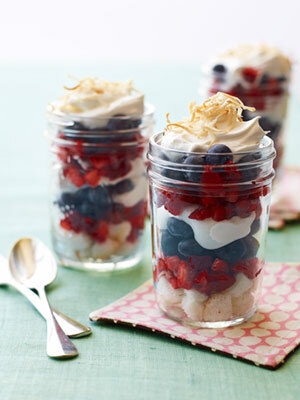 Before serving, top each parfait with 1 tablespoon coconut. Filled with a mix of anything red, white or blue ie, candies, potato chips, popcorn, etc. Wrap to form cone, and attach sides with glue stick or double-sided tape. To prevent grease marks, line the inside of the cone with waxed paper if desired. A portable version of the popular Flag Cake, this American themed treat is designed to inspire. Prepare cupcakes: Preheat oven to 350 degrees F. Line 20 muffin-pan cups with cupcake liners. 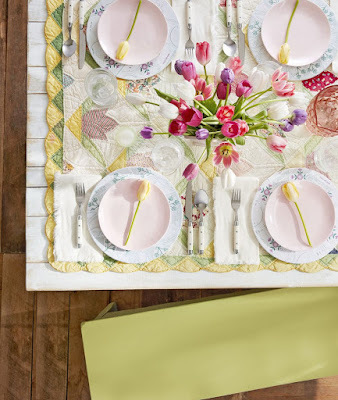 On sheet of waxed paper, combine flour, baking powder, baking soda, and salt; set aside. In large bowl, with mixer on medium-high speed, beat granulated sugar and 8 tablespoons butter 5 minutes or until pale and fluffy, scraping bowl with rubber spatula. From lemon, grate 3 teaspoons peel; reserve 1 teaspoon peel and set aside. With mixer on medium-high speed, add remaining 2 teaspoons peel to butter mixture and beat 1 minute. Add eggs 1 at a time, beating well after each addition and scraping bowl with rubber spatula. With mixer on low speed, add flour mixture into egg mixture alternately with buttermilk, beginning and ending with flour mixture, just until blended. 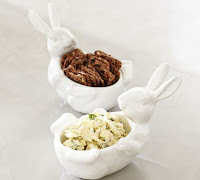 Prepare frosting: In bowl, with mixer on low speed, blend cream cheese, confectioners' sugar, remaining 4 tablespoons butter, and remaining 1 teaspoon lemon peel. Increase speed to high; beat 3 to 5 minutes or until pale and fluffy. Spread frosting on cupcakes. 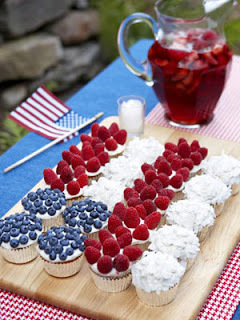 Top 4 cupcakes with blueberries, 8 with raspberries, and 8 with coconut; arrange on platter to resemble American flag. 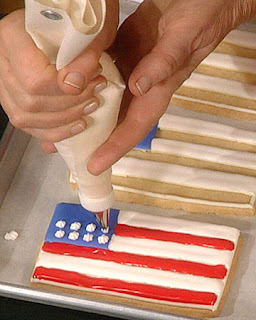 This simple sugar cookie, decorated with royal icing in red, white, and blue, makes a perfect patriotic treat. To achieve flawless flag stripes, use plastic squeeze bottles to flood the cookies with royal icing. These festive cookies utilize crushed hard candy pieces to make colored-glass like cutouts. Prepare cookies: On waxed paper, combine flour, baking soda, and salt. In large bowl, with mixer (preferably with paddle attachment) on medium speed, beat butter and granulated sugar 1 minute or until creamy, occasionally scraping bowl. Add egg yolk and vanilla; beat until well mixed. Reduce speed to low; gradually beat in flour mixture until blended and some clumps form, occasionally scraping bowl. Press dough into disk. Wrap in plastic wrap; refrigerate up to 30 minutes. While dough is chilling, place each color of hard candy in a separate heavy-duty plastic bag; seal bags. Place 1 bag on towel-covered work surface. With meat mallet or heavy skillet, crush candies into small pieces about the size of coarsely chopped nuts, being careful not to crush until powdery. Repeat with remaining candies. Place 2 racks in center of oven. Preheat oven to 350 degrees F. Line 2 cookie sheets with parchment. Remove dough from refrigerator and place between 2 sheets parchment paper; roll to scant 1/4 inch thick. Remove top sheet of parchment. 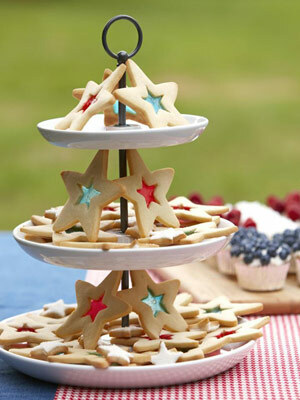 With 3- to 4-inch star-shaped cookie cutter, cut out as many cookies as possible. Transfer stars to prepared cookie sheet (using metal spatula if necessary); place 1 inch apart. Press together trimmings; reroll and cut out additional stars, repeating as necessary. Bake large stars 7 minutes. Remove cookie sheets from oven; fill each cookie's center with 1 teaspoon crushed candy. 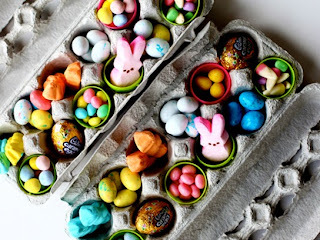 Return to oven and bake 5 to 8 minutes longer or until edges are lightly browned and candy is melted. Slide cookies on parchment onto wire racks to cool completely. Slide parchment with center stars onto 1 cookie sheet. Immediately bake center stars 10 to 12 minutes or until golden brown. Slide cookies on parchment onto wire rack to cool completely. 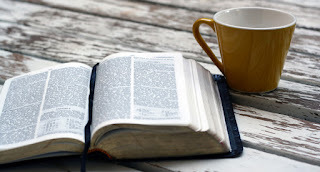 Prepare icing: In small bowl, stir together confectioners' sugar and 2 teaspoons water until smooth, adding additional teaspoon water if icing is too thick to spread. Spread icing on 1 center star and sprinkle 1/4 teaspoon sparkling sugar over it. Repeat with remaining center stars, icing, and sparkling sugar. Let stand until icing sets, about 5 minutes. Cookies can be stored in tightly sealed container at room temperature up to 2 weeks, or in freezer up to 3 months. Not all side dishes are created equal: Just take this refreshing combo — a savory salad of watermelon chunks tossed with crumbled blue cheese. 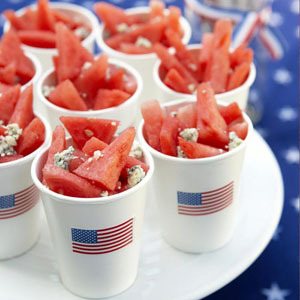 Portion servings into plain-Jane paper cups made patriotic with inexpensive stars-and-stripes stickers. 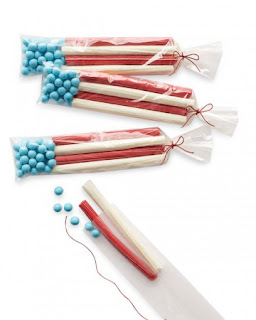 A spirited holiday celebration calls for a fun take-home treat, like this goody bag of candies arranged to resemble the American flag. Start by partially filling a 2-by-10-inch cellophane bag with blue candies to stand in for stars. Then add red and white candy sticks to mimic stripes. Tie the bag with red waxed twine, and don't be surprised if you catch yourself humming "Stars and Stripes Forever." Sift flour, baking powder, and salt into a large bowl. Cream butter and granulated sugar, with a mixer on medium speed, until pale and fluffy. Beat in yolks and vanilla until well combined. Add flour mixture in 3 additions, alternating with cream and beating well after each addition. Shape dough into 4 disks, wrap each in plastic, and refrigerate for at least 3 hours (or up to 3 days). On floured parchment, roll 1 disk of dough into a 1/8-inch-thick rectangle. Repeat with remaining disks. Stack sheets of dough and parchment, and refrigerate for 1 hour or freeze for 30 minutes. Spread raspberry jam on 1 sheet of dough, blueberry jam on another. Top each with a plain sheet of dough. Refrigerate for 1 hour or freeze for 30 minutes. Preheat oven to 350 degrees. 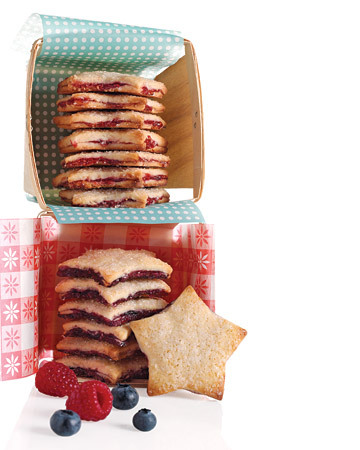 Cut out cookies using a 2 1/2-inch star-shaped cutter, and space 1 inch apart on parchment-lined baking sheets. Brush with cream, and sprinkle with sanding sugar. Refrigerate for 30 minutes or freeze for 15 minutes. Bake, rotating sheets halfway through, until golden, 16 to 20 minutes. Transfer cookies to wire racks, and let cool completely. If desired, bake dough scraps. Do You Grow or Wilt in the Difficult Times?